Vladimir Putin met with members of the Council of Legislators of the Russian Federation Federal Assembly. 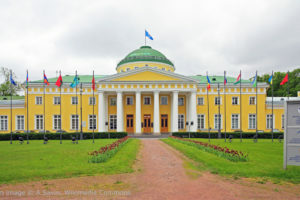 By tradition, the meeting took place at the Tauride Palace and was timed to coincide with Russian Parliamentarianism Day, marked on April 27. Improving legislation for countering corruption, regulating trade and import replacement, and parliamentary oversight of regional policy were the main subjects of discussion. We are meeting with Russian Parliamentarianism Day just around the corner, and I congratulate you warmly on this occasion. The Council of Legislators is meeting here, in the Tauride Palace, the historical palace where, 111 years ago, Russia’s first State Duma began its work. The tradition of holding the Council’s meetings here symbolises the historical continuity in parliamentary work. This is very important because representative bodies in our country have not travelled an easy road in their establishment and development. Today, we have established a stable system that meets modern parliamentary criteria, and our legislative and representative bodies work actively at all levels, from the Federation Council to the regional parliaments that you represent, and the municipal councils. Most importantly, we see greater respect now in our society for the work of parliaments as the representative bodies of power at the local, regional and national levels. The Council of Legislators was established primarily to analyse best regional practice, exchange experience, and elaborate effective legislative solutions. You discuss a very broad range of issues and do not limit yourselves to issues topical only for people in this or that particular part of the country. You address common national issues, and I know from my experience of past meetings that you propose legislative recommendations and take on your colleagues’ positive achievements. This is a very good, reliable and needed platform. The Council grows stronger every year. We see how useful its work is for legislators at the regional and federal level. You have already done much to improve the legislative process and raise the level of law-making culture. But we are all well aware that not all problems have been solved yet. We have yet to achieve a comprehensive and systemic approach to creating and adjusting the legislative base. Draft laws have not always received the deep and all-round study and consideration they need. Scientific and expert evaluations are not always given sufficient consideration, and regrettably (this is only partially your fault and is also partly the fault of your colleagues in the executive bodies), we still see the problem of haste, unjustified rush jobs and even great flurries of work with little result. Why do I say that this is a mutual responsibility? Because life brings us ever new tasks and challenges that often arise very suddenly. Of course, the legislative bodies want to formulate rules of the game for this or that situation facing society in a region or in the country as a whole in swift time, and the executive authorities often incite this haste by demanding ever faster responses. But it is to take a simplistic logic to imagine that the faster we pass laws the better, and if there are problems, we can always add to them or amend them later. Sometimes, these adjustments then go on for years and we end up with a dozen or more amendments. This creates a good few problems and glitches in laws’ practical implementation. Guaranteeing a stable and predictable legislative process remains one of our key priorities. One of the difficulties here is that we must make a constant effort to take into account our citizens’ and society’s demands. The legislative and executive authorities work for the people and serve the people. Great professionalism is required in drafting the laws needed by society and that must fit harmoniously into the general legislative process and legal base. Your Council has succeeded in restraining many unneeded, mistaken or simply superfluous legislative initiatives. I think you should make even greater effort here, however, not just at Council meetings, but in your daily legislative activity in the regions. Naturally, everyone wants to look like they are doing a good job and take decisions that will bring milk and honey raining down from heaven. Only this milk and honey will not come. There will be no miracle. Decisions must be carefully considered and based on the reality and on our possibilities and society’s needs and demands. Let me add that you should meet more often with people, talk to them, try to understand their points of view. This applies to all issues on which you need to decide. I want to mention one particular issue now. As you know, 2017 is the Year of the Environment in Russia. I remind you that we also set the ambitious goal of a gradual transition to a model of sustainable environmental development. In this respect, we have a great many issues on the agenda today, including dramatic reduction of harmful atmospheric emissions, waste treatment and disposal, energy conservation solutions, and improvement and development work in towns and villages. The legislators must be attentive, very attentive, to environmental issues and must consult with local people, civil society organisations, and with the business community, business associations. This is a task that involves balancing two sides of the same coin because on the one hand, you cannot stifle production and manufacturing with unjustified demands, and on the other hand, you cannot remain forever locked into outdated norms that hold back production, damage the environment, and worsen people’s living environment. Environmental concerns affect everyone and we must resolve them collectively. In conclusion, I want to congratulate you on our big holiday, Victory Day, which is coming up soon. Preparations are going full steam ahead. The regions have many tasks here too, the main one being to resolve in timely fashion any problems facing veterans. Every veteran should receive constant care and attention. I have no doubt that these celebratory May days will be marked in worthy fashion and at the highest level everywhere. Mr President, let me start by thanking you for what have now become regular meetings with the Council of Legislators’ members on the eve of Russian Parliamentarianism Day. This has great importance for us as it is an opportunity for the leaders of regional parliaments to put questions to you directly, and hear your approaches and vision. These meetings have a practical dimension too. Following the meetings, you always sign a list of instructions that are implemented in full. Let me give you one example. At our last meeting, the head of Kamchatka’s parliament raised the matter of passing a law requiring fishing companies engaged in coastal fishing to register in the region in which they fish. This is probably the only case, in terms of speed, when by July 3, you signed a law that brought this rule into effect. This is tremendously important for the Far East regions, because it means jobs, tax revenue for local budgets, and it puts order into this activity under regional supervision. I could list many such examples today. The Council marks its fifth anniversary this year. This is not a long time, but we can say with confidence that the Council is a very authoritative, useful and needed body within the Federal Assembly. Together, we coordinate the lawmakers’ work at the federal and regional levels. We take the regions’ views into account in the legislative process, and this is very important. Representatives of the regional parliaments are very actively involved in this work. This has become a kind of systemic ‘lift’ for promoting regional legislative initiatives on the federal agenda. We have ongoing dialogue between the federal and regional lawmakers, and this is greatly important for strengthening federal relations. Within the Council of Legislators too, we have close coordination between the State Duma and the Federation Council. We have no differences. We certainly do debate with each other, try to persuade each other, but we always listen attentively to each other and in the end, we always reach compromise solutions that are reflected in the laws passed. It is clear today that the regional governors and governments, and also the regional parliaments and their heads bear responsibility for their regions’ effective social and economic development. In the regions where this is understood, and where there is constructive interaction between the governor and the regional parliament, respect for the deputies, whose views are taken into account, and where the parliament is made up of diverse cross section of deputies and various parties and movements, the results are considerably higher in general. Most importantly, this creates a favourable climate for doing business and for investment, and a more stable situation in general in the regions. You set the example with your regular meetings with the heads of regional parliaments. I think that some governors will take note of this experience and be more active in their work with regional parliaments. We could call last year a milestone in terms of regional policy development. A Security Council meeting was held at your instruction that followed a number of preliminary consultations you held personally. Acting on the resulting Security Council decisions and your instructions, we approved the new basic principles for state regional policy through to 2025, updated and better adapted to today’s situation. The Government has approved an action plan for implementing these new principles and has been instructed to present to the President an annual report on implementing the basic principles for regional policy and social and economic development in the regions, as well as to report each year to the upper house of parliament on the results of economic and social development and engage in dialogue with the upper house. For the Federation Council, as the chamber representing the regions, our main priority is to strengthen federal relations and create the conditions needed to correct disparities in regions’ economic and social development. Today, one of the items on the Council of Legislators’ agenda is to examine the report on the state of and main areas for improvement for Russian legislation in the area of state regional policy. This was what the Security Council tasked us with. This report was drafted by both houses of parliament together, the Federation Council and the State Duma. The heads of all regional parliaments and the regional parliaments themselves took part in this work. We think this is a solid document, but after the discussion today, we will clarify and revise it further and, by May 30, as required, we will present it to you in fulfilment of the Security Council decisions. This document will become a regional policy roadmap for the next few years. There are still improvements to be made and work to be done. The process is not entirely complete yet. Mr President, an important international parliamentary event will take place in St Petersburg this year: The 137th session of the Inter-Parliamentary Union. This is one of the oldest, actually, the oldest international inter-parliamentary forum, comprised of national delegations from 173 countries. I would like to thank you once again for supporting this idea. It was a great pleasure for us to see at the last Inter-Parliamentary Union session that the absolute majority of national delegations supported the idea of holding the 137th session in Russia. This reflects their assessment of our experience, their support for our parliament, and their attitude towards our country, of course. You have already given the instruction on establishing the organising committee for this event. I want to thank the heads of all the federal bodies of power, and Governor of St Petersburg Georgy Poltavchenko. We are carrying out the preparatory work very actively and want to hold the event and welcome our guests at the highest level. We have proposed a positive, constructive, non-confrontational and unifying agenda. I am sure that the national delegations will see Russia and St Petersburg for themselves and will hear from the source about our foreign and domestic policy priorities and how Russia defends its various interests in the world. We also had the idea of putting the proposal at this session to call on the United Nations to establish an International Parliamentarianism Day. If you look at the UN calendar, you see that they have Groundhog Day and all kinds of occasions, but there is no International Parliamentarianism Day. I think that today more than ever the work of legislative and representative bodies is important and needed and parliaments’ authority continues to grow. It would be right therefore if the UN included in its calendar of dates International Parliamentarianism Day. We, the Federal Assembly and the Inter-Parliamentary Union have proposed this idea and we are sure that we will be supported. One of the Federal Assembly Council of Legislators’ main priorities is to make our legislative base more stable and systemic, raise the quality of law-making, and make implementation of laws more effective. The President underscored the importance of this work in his remarks just now. Achieving this objective requires close cooperation between the Federal Assembly and the regional parliaments and the Government. It requires dialogue and coordination. In this respect, I want to tell you about what we have already done in this area of late and make several proposals that we discussed together earlier at a meeting of the Council of Legislators’ presidium. First, systematising the practice of making amendments to codes currently in force is a key task. To this end, the State Duma approved a regulation last year, in accordance with which any amendment to the Civil Code can be passed only in the form of a separate law and not as amendments added in the second reading to often unrelated draft laws. A similar provision already applies to the Criminal and Criminal Procedure Codes, and will soon take effect with regard to the Administrative Offences Code. Second, the quality of laws and effectiveness of their implementation depends to a large extent on the time it takes to adopt norms and laws. In this respect, Mr President, we said at the last Council of Legislators meeting that there are laws that sit on the shelves for two or three years but cannot be implemented because the norms and regulations that make it possible to implement them do not exist yet. To address this situation, we have agreed with the Government that by the time a law comes to its third reading, we will receive the needed information on preparation of draft bylaws. This should increase the quality of laws passed and speed up their practical implementation. The relevant amendments have been made not just to the State Duma’s regulations following this dialogue, but to the Government’s regulations too. Previously, this was not an obligation but a recommendation, while now, we have reached agreement on ensuring that our work is synchronised. We think that this will help to resolve many issues given that efforts will concentrate on ensuring that draft bylaws and regulations are ready by the time the third reading comes along. Then draft laws before the State Duma will be effectively accompanied by preparation of the needed bylaws. Third. Another fundamental issue is the practical effect that a draft law has after it enters into force. It is very important that deputies fully appreciate all the consequences of decisions made at all levels of discussion and adoption of new laws. To date, we still cannot predict what consequences a law will have, especially if we talk about initiatives from deputies. This is because there has not been thorough evaluation to regulate the effect of draft laws, and legislative initiatives of deputies make up almost half, or even more, of all draft laws under consideration. In this regard, the State Duma held talks with the Government, and an agreement was reached to request an assessment of the regulatory impact of key draft laws that are of great social significance and influence the business climate. Fourth. It is important that the Council of Legislators provide more effective help to regional parliaments to promote their legislative initiatives and be a real legislative lift. Only 10-11 percent of legislative initiatives come from regional parliaments, and this figure is in fact so small not because there are no initiatives, but because they are not thoroughly worked through, the documents have not been drafted properly. These legislative initiatives are often rejected not because of their content but for issues of form. Therefore, it is extremely important for us to support our regional colleagues within the framework of the Council. We believe that due to this assistance it will be possible to support more regional initiatives at the federal level, because they will be better prepared and better developed. And colleagues will know about them and thus will provide support. Fifth. It is not a secret that some of the highest quality draft laws in terms of drafting, design and thoroughness, come from the President and the Government. This is due, among other things, to the fact that the drafting of these laws involves a strong expert base of ministries, leading expert centres, and universities. And they really outstrip legislative initiatives that are prepared by deputies, members of the Federation Council, and, as I said, by regional parliaments. Our task is to ensure that legislative initiatives of deputies are no less thorough. Often, we received for consideration legislative initiatives that are very important for citizens, but we are forced, as I said, to reject them only because they are poorly developed or improperly drafted. Mr President, in this context I would like to thank you on behalf of my colleagues for supporting the State Duma initiative on a law-making centre as an institution that will provide legal support to the deputies’ legislative initiatives and analyse and prepare them for submission to the State Duma. With your support, this centre will provide legal support not only to State Duma deputies, but also to members of the Federation Council and regional lawmakers. This would allow us to draft better laws and also to attract experts to this work. Moreover, this would help us to streamline the law-making process, which will definitely enhance the overall quality of our laws. Mr President, we suggest that the regions take a more active part in this work and that the Council of Legislators be used for discussing and improving the key decisions in the economy, social policy and regional development. For example, the regions are actively adopting a target-based system of social benefits under which the size of benefits depends on the individual requirements of recipients. However, the regions have different views on requirements and the status of various social benefits. This results in social inequality within the same group of recipients who live in different, even if neighbouring, regions. In this connection, we should organise discussions on this issue at the Council of Legislators and use situation monitoring and analysis to coordinate standards for different groups of recipients. We plan to discuss this and also other issues at the Council meeting today. Mr President, we are grateful for your attention to the Council of Legislators and to developing the parliamentary system of government in Russia. This is really very important for us, and we do feel your support.